Weymouth's popularity as a seaside resort is largely attributed to King George III who came to bathe in the sea as a health cure for his nervous disorder. It has been a port for many Centuries and evidence shows that Roman Galleys sailed up the River Wey as far as Radipole where they could be beached. With the Roman capture of Maiden Castle in AD43 the estuary of the River Wey came into regular use as a port. Mention of the Port is made for the first time in 1100 when the ports belonging to Weymouth and Melcombe Regis were granted to the Convent and Prior of St Swithin of Winchester. A local charter of 1252 mentions the Port of Weymouth and in 1347 it supplied 15 ships and 263 mariners for the siege of Calais. During the 15th Century it prospered partly as a result of a substantial trade in pilgrims sailing to Spain. In 1588 ships were supplied for the fight against the Spanish Armada. In the days of colonial expansion many emigrants to the New World sailed from Weymouth. During the Second World War Weymouth played an active part in support of D-Day and the invasion of Normandy. Although as far as is known it was never used, one interesting wartime development was a railway ferry terminal capable of loading rolling stock directly to shipping. It was built during the war and then dismantled. 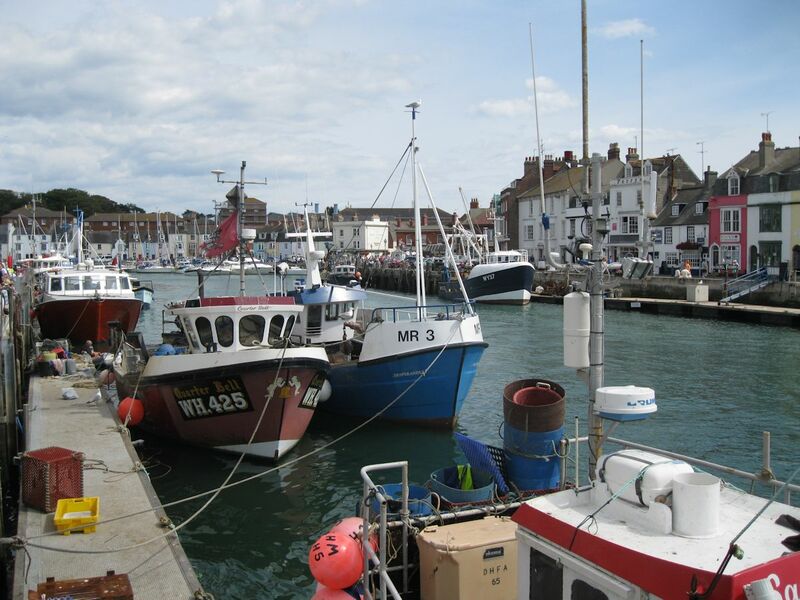 Also, because of the German invasion of the Channel Islands, Weymouth Harbour became the entry port for the whole population of Alderney when the island was evacuated on 23rd June 1940. Weymouth is also proud of its record as being the only port in the world to have hosted the start of the Cutty Sark Tall Ships race on three separate occasions. We have also become one of the ports to host the start/finish legs of the international biennial Starmanche yacht race running from France to Ireland via Weymouth and back to France. The Port of Weymouth is managed and controlled by the local Borough Council, and offers up to date facilities for handling both passengers and freight. The Weymouth Passenger Terminal is operated by Condor Ferries. Commercial fishing remains a key activity within the port. Substantial marina facilities are available below Town Bridge in the old Georgian harbour.